My name is Bond and I have a license to kill - your savings! It is ironic that after the stock market crash of 2008/09 (stocks have recovered since) most investors cursed stocks and moved all or most of their savings into Bonds (or cash deposits) because these are incorrectly perceived as safe. A historic high number of savers are at this point keeping what is left of their savings in Bonds and they are about to loose this money. Nobody will be arrested and jailed for the largest holdup of this century as it will be held by Authorities together with Central banks. The Herd is about to pay a high price for its blind BELIEF in Politicians, Banksters, Talking Heads and Fiat Paper money (Bank deposits) and the options to buy Fiat Paper money (Bonds and other fixed interest instruments). Things are about to get so bad that even Inflation adjustable Bonds won't be able to keep your feet dry! About two year ago we warned for this scenario and yet the Herd has (would you have expected it otherwise) decided to stay in Bonds. Pimco's world's largest bond-fund manager Bill Gross warned only weeks ago that Bond holders were about to suffer great losses and has probably started to get out of the sector....but he can't possibly move out overnight nor can he move out completely as such would be against the law. (legislation in many countries stipulate part of the assets of insurance co's and pension funds MUST be kept in Government bonds). Assuming he could move out of the Bond/Gilts sector, he and other large Fund Managers would crush the bond market like elephants do when they migrate. I have no doubt more people would listen if Pimco's manager was a nice cute blonde, a base ball player or a movie star acting in one of the Bond movies. Intelligent people however tend to have a different look and they are most of the time also not very good sportsmen. Not that I have something against these kind of people – no, I rather have something against the empty heads which keep listening to these kind of idiocies and/or prefer to live in denial instead of making their home work and acting accordingly. Like the 1930 Stock Market crash the Bank crisis of 2008 has cost savers a lot of money and today many smell rat about Fiat Paper money. Bank notes might be worth only the ink and the paper (providing it's not digital) they are printed on and the financial crisis is about to move beyond Banks and Money. 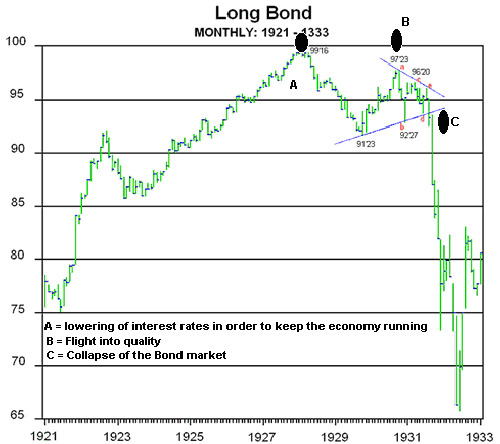 This is what the 1933 Bond crash looked like...and also what the 2011 Domino crash starts to look like! Bonds have the power to punish governments for their mismanagement by increasing borrowing costs (Greece, Ireland, Iceland, Portugal, Spain, American municipalities,....) This is exactly what we have seen over the past months. After a stock market crash (example 2008/09) Stocks always bounce back because stocks are real assets. Bonds move in a more orderly way and at a slower pace than Stocks and if all goes well, the Bond holder knows the money he invested will be paid back at the redemption date 9in fait money, off course). If however an accident occurs (debt moratorium, hyperinflation), the Bondholder will always loose his savings. This is particularly true for Bonds issued by Governments: as a rule Authorities NEVER pay back their debts. Normally the debt is at first inflated away and what is left of the real value/purchasing power subjected to a debt moratorium. In the old days Bonds used to be the favorite investment instrument of the Nobles and Aristocracy and it was with bonds that most wars used to be financed. Instead of paying taxes, wealthier citizens were “obliged” to lend money to their own governments. In return for these forced loans, they received interest. The big advantage over taxes was that these Bonds (Consols) could be sold to any other party if the Aristocrat was in need for fast cash and that the money was returned to him at the redemption date. The price of these War Bonds would come down or to go up in function of how long citizens judged a war would last for. The longer a War the more it would cost and the smaller the odds that the money would be paid back and the price of Bonds came down accordingly. During the 18th century Soldiers were paid in Gold coins. Hence the challenge to make money was to convert Gold for Bonds when you were convinced the war would end soon and to exchange Bonds for Gold if you knew a war was about to start. The Rothschilds made their fortunes during the Napoleonic Wars and established themselves as the dominant players in the international London bull market. Although Gilts (British government bonds) were the principal security marketed by the Rothschilds, they also sold French, Prussian, Russian and Belgian bonds (they used to buy new bonds from government, charging a commission for distributing these to their brokers and investors (note: today when government issues new bonds, they still operate in a similar way). During the civil war in the USA the Confederate issued bonds which were sold to the British aristocrats and were guaranteed by cotton. But the Union blockade made it impossible for the international investor to claim the cotton as they had to run through the enemy lines twice before they could take it home. The Bonds became worthless and the confederates had no choice but to start printing money debt monetization)...and enter an era of hyperinflation. In the 19th century the number of bondholders was barely 2% of the population. Is was because of the Wars (WW I and WW II) that the privilege to buy bonds was extended to non-nobles. The American civil war is a good example of what happened since: each time the non-nobles lost their savings. During the Great World Wars all warring countries persuaded thousands of small savers who had never previously purchased government bonds that it was their patriotic duty to do so. Germany however did not have access to the financial markets of London and was therefore unable to tap the international bond market....the country was left with no other choice but to print marks, especially after France had retaken Elzas and Lotharingen (the German heavy industry). This is how the Weimar inflation as born. A bond market which crashes has the same effect as taxation. We not only see the value of the Bonds fall, but at the same time the savings of those who have to live from a fixed income just disappear. To add injury to insult, this mostly happens in an inflationary environment so that the loss becomes exponential...and the people have no alternate but to revolt. (Egypt). [Note: Real Savings are a fundamental necessity for a sound economy]. The irony is that today the Herd is keeping its’ savings “again” in Bonds…. The banknote-printing press is the machine gun of the commissariat of Finance which pours fire into the rear of the bourgeois system (Preobrazhensky – partner of Lenin). Today's big development in the bond market is the breakdown in the long bond market: Greece, Belgium, Ireland, USA treasuries, etc....This signals the bond markets and the interest rates are heading for a complete opposite direction the central banks have been intending. Bond but also Nathan Rothschild are about to make another kill.